May 1-3, The Windowpane Press Studio in Seattle, Washington. Workshop Description - Parchment has a mystique and a mind of its own. The mystique we admire, the mind we must work with! The hygroscopic nature of this wonderful material allows it to expand and contract as the environment changes, but the strength and durability of parchment make it an ideal material for bookbinding. Its successful use is a valuable addition to your skill set. During this workshop you will create a parchment binding over boards, which will accentuate the beauty of material and compensate for its tendency to wander. You will construct a Dutch style (laced-on case with a groove) parchment binding. There is an expectation of intermediate bookbinding skills for this class. 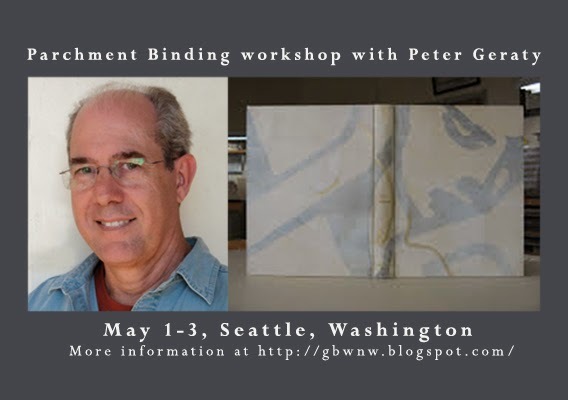 Peter Geraty began bookbinding in 1975 at Unicorn Press in Greensboro, NC where he worked as a printer, typesetter and binder for several years. He moved to Boston, in 1977 and continued working as a binder at various places including; library binding at the New England Bookbinding Company, conservation at the Museum of Comparative Zoology at Harvard University and over four years at Harcourt Bindery ending his time there as shop manager. In 1984 he began working as an independent binder and in 1985 moved to Easthampton, MA. As owner of Praxis Bindery, he has focused on conservation, fine binding and binding of editions and presentation materials for publishers and artists. Peter is intrigued by the challenge of combining design, structure, and materials to present text or art. The name he chose for his bindery, Praxis, encompasses his ongoing philosophy to continually hone one’s craftsmanship and pursue deeper knowledge. Visit Peter’s website at https://www.praxisbindery.com.